Need to understand your love's actions? Want to know what they are thinking and feeling? Call me, Mitzi Little. With over 25 years experience in love and relationship readings, I know. In the Southern backwoods of Alabama, there is a tradition of "having the sight" or "reading sign." I come from that tradition. Many of the women in my family have the gift. My Mama had such a psychic connection with her sister (who lived 50 miles away) that when she was coming to visit her, she never used the phone. All she had to do was think about it and her sister would be waiting at the window looking for her. Her mother, my Grandmother had the spirits of her loved ones visit often and tell her things that she needed to know. My Grandmother's mother could hear the voices of Spirit. I am the first one in my family to read for a living, but, as you can see, this is something that is in my blood. I have been reading Tarot since I was 9 years old ----- since the cards were too big for my hands. I have been reading professionally for over 25 years. I know, what ever your problem is, big or small, that my guides and I can help you solve it using the Tarot. 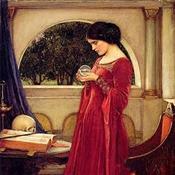 I have several different methods of divination to choose from in order to connect with your energy, but I prefer Tarot cards. I received my first deck as a gift when I was 9 years old and I was hooked! I find that the cards give me an instant connection. This is particularly helpful when reading for a new client. The cards prime the pump of my clairvoyance and get me started. Usually, by the end of the reading, I am relying solely on my clairvoyance. I need at least 5 minutes to do a thorough reading. Ordering time in 1 or 2 minute increments disrupts the flow of the reading and tends to give me a headache. Please order time in blocks of 5 minutes or more. For every reading that lasts 15 minutes or longer, you will get 3 FREE minutes. Thank you for very positive chat with you. Very professional and experienced advisor! I would like to recommend to anyone who is seeking to find right answer about the love relationship. This was a bad reading. She said something that I know 100% to be false and then disconnected hoping she wouldn't get rated on for it. What a scam! Thanks Mitzi for keeping me on track! Mitzi Little has been a user of Keen since 2001. Getting Love & Relationships advice from Mitzi Little through www.keen.com is safe, secure and confidential.